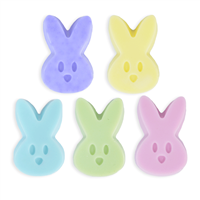 These chocolate scented bunny soaps will make the perfect Easter basket stuffers. Just be sure your label says "SOAP" so they don't get confused with the real thing! 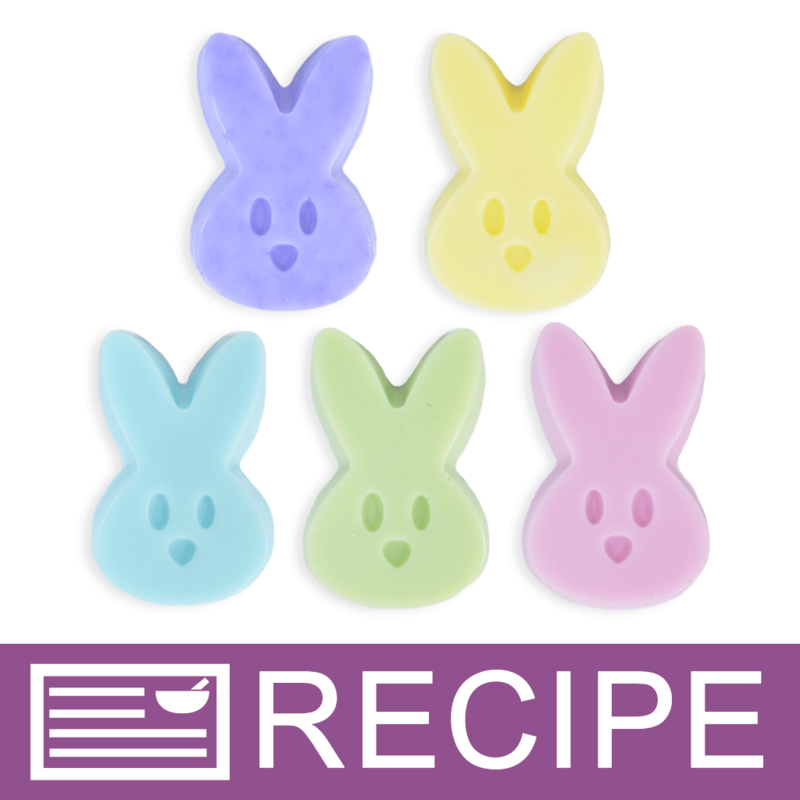 Or, switch out the fragrance and make these an adorable baby shower favor. Your guests will love them! In plastic beaker mix 0.30 oz. fragrance with 0.15 oz. vanilla stabilizer. Mix and let sit for 2 minutes. To a microwave-safe measuring cup add 11 oz. of cut up soap. Heat in microwave in 30 second intervals until melted. Add fragrance mixture and desired drops of first color. Stir well. Place silicone mold on cookie sheet. Pour soap into all cavities filling to the top. Spritz soap with rubbing alcohol to break any surface bubbles. Let soap set up. Soap can be placed in refrigerator for 30-45 minutes to harden. Using a clean measuring cup, repeat Steps 1-4 with a second color and continue until all five colors have been made. Package one of each color into poly bag and tie with curling ribbons. Tip for packaging: cut a strip of poster board slightly thinner than the poly bag. 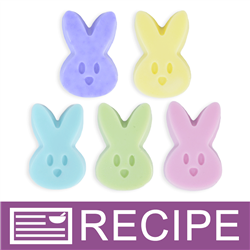 Place inside the poly bag, then push the soap bunnies onto the poster board. This will help slide them into the bag since the soaps will stick when trying to place in the bags. Remove poster board once soaps are in bag. Label product accordingly. Be sure to add "SOAP - DO NOT EAT" on the label. Ingredient Label: Sorbitol, Coconut Oil, Propylene Glycol, Stearic Acid, Water, Sodium Hydroxide, Glycerin, Honey, Buttermilk, Oatmeal, Calendula Extract, Titanium Dioxide, Fragrance, Green 5, Yellow 5, Blue 1, Red 33, Ext Violet 2.